John Adams was born on October 30, 1735, at Braintree, Massachusetts, to John Adams, Sr. and Susanna Boylston Adams. Many of his relatives were well-to-do, but John was raised in a simple, rural setting. He graduated from Harvard College in 1755, studied law and returned to Braintree to launch his law practice in 1764. From this meeting and throughout their fifty-four-year marriage, a strong love and intellectual companionship provided a sturdy bond for their relationship. Abigail thought of John as her best friend, and as an old woman, she still remembered the thrill she felt the first time he held her hand. Abigail Smith married John Adams on October 25, 1764, in the Smith home in Weymouth. Her father performed the ceremony. After the reception, the couple mounted a single horse and rode off to their new home, the small cottage and farm that John had inherited from his father in Braintree. The year 1765 brought out the colonists’ revolutionary tendencies with the passing of the Stamp Act. John Adams was the first to show resistance, and he often tried to prepare his young bride for the trials and sacrifices that he believed must occur before his beloved country could be free of British rule. Abigail gave birth to six children, the first four within five years: Abigail (Nabby) in 1765, John Quincy Adams in 1767, Susanna (who died at age thirteen months) in 1768, Charles in 1770, Thomas in 1772 and Elizabeth who was stillborn in 1777. Abigail stayed at home, while John traveled building his career as a lawyer. With cases in Maine and other parts of New England, he spent weeks and months away from home; as his career prospered, his absences grew longer and more frequent. Abigail’s management of the farm was uncommon for a woman of that era; her profits from the farm and John’s legal practice supported the family. In 1768, Abigail and John moved to a rented house in Boston, because most of his work was there. The family became part of a social circle that included such patriots as John’s cousin, Samuel Adams, John Hancock, James Otis and Joseph Warren. But there was little time for socializing when dramatic events in Boston began overshadowing all other concerns. Abigail was delighted with Boston, the “Noisy, Busy town,” where she could read four different newspapers a week and socialize with the city’s most influential families. Although stimulating, her life in Boston was difficult. In just a few years, they moved their large household several times. Also, the first movements of the revolution were stirring in Boston. This was a time of great political upheaval. The colonists wanted to remain loyal to the British king, while at the same time refusing to submit to taxation without representation. Two regiments of British regulars arrived in Boston in September 1768 in response to a call by the Royal Governor to restore order and respect for British law. During the last months of 1768, Abigail suffered from migraines and chronic insomnia, as well as a difficult pregnancy. The Adams’ third child, Susanna, was born towards the end of 1768, but only lived for a year. Four months after Susanna’s death, Abigail gave birth to their son Charles. Despite bouts with illness, Abigail gave birth to four children in just over five years. During the next two years, hostilities between the Tories (colonists who supported the king) and the Patriots increased. In 1771, concerned with Abigail’s continuing poor health, John returned his family to their home in Braintree for a time. Sixteen months later, Abigail gave birth to their third son, Thomas. At times John relentlessly traveled the law circuit, earning as much as he could so that he could leave Abigail with a cash reserve until he would be able to return. His reputation and ambition threw him increasingly into the public eye, and he was elected to serve in the first Continental Congress in Philadelphia. Unfortunately, this would take him farther away from his family and for a longer time than ever before. With John in Philadelphia, Abigail entered a new period in her married and personal life. The increased responsibility of managing a large household gave her a growing sense of confidence in her abilities. She even took it upon herself to make some investment decisions. In April 1775, the first deadly conflict took place at the Battle of Lexington. When the news reached Abigail in Braintree, there was a sense of relief because the waiting was over. But orders had been given to seize and imprison members of Congress, and Abigail expected hourly that British troops would barge into her house, searching for her husband. With the coming of the American Revolution, Abigail was basically left to run their household alone for ten years while John served the country they both loved. The Adams home in Braintree was used as a meeting place for the minutemen. John Quincy Adams recalled at the age of seven seeing a group of these men turning pewter spoons, which Abigail had given them, into bullets. As the Second Continental Congress drafted and debated the Declaration of Independence, Abigail began to urge John in her letters that the creation of a new form of government was an opportunity to make the legal status of women equal to that of men. The text of those letters became some of the earliest known writings calling for women’s rights. She believed that women should educate themselves, so they could guide and influence the lives of their children and husbands. In John’s absence, dispatches arrived at the Braintree farm from Congress, and Abigail learned of her husband’s appointment as a commissioner to France (with Benjamin Franklin and Arthur Lee). Although John left the decision up to Abigail as to whether he would accept or decline the appointment, she knew what the choice must be. Their first thought was that the whole family should go with John, but later it was decided it was too dangerous. Instead John took only their eleven year old son, John Quincy, with him. They left Braintree in early February 1778. While John was in Europe, Abigail kept him informed of domestic politics, while he confided international affairs to her. I have waited with great patience, restraining as much as possible every anxious Idea for 3 Months. But now every Vessel which arrives sits my expectation upon the wing, and I pray my Guardian Genius to waft me the happy tidings of your Safety and Welfare. Difficult as the Day is, cruel as this War has been, separated as I am on account of it from the dearest connection in life, I would not exchange my country for the Wealth of the Indies, or be any other than an American. John’s first stay in Europe was largely unproductive, and father and son returned to America. In September 1779, Congress sent John to France again to negotiate a peace treaty between the United States and Great Britain. In September 1783, negotiations by Adams and his fellow commissioners led to Britain’s recognition of the independence of the United States in the Treaty of Paris in September 3, 1783. After her father was laid to rest beside her mother, Abigail set sail for England in 1784. It had been five years since she had seen her husband, and their son John Quincy was now a young man of seventeen. After Abigail’s arrival, John took the family to Paris where they lived for a year. In 1785, Congress appointed John first U.S. ambassador to Britain, a position he held until 1788. Abigail was in awe of the bustling streets of London, having lived in the countryside of Massachusetts all her life. They lived in London for three years. In April 1788, the family set sail for home, returning to the “Old House” in Braintree, which would remain their home for the rest of their lives. 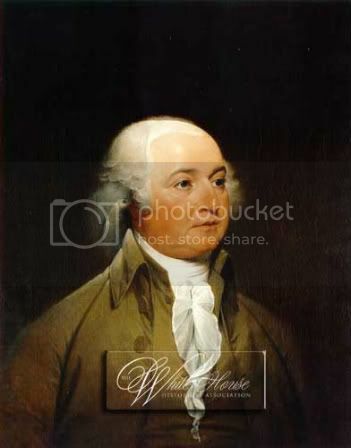 In 1789, the government of the United States was organized, and John Adams was elected the first Vice-President, under George Washington.The first United States Congress met in New York, where Abigail moved her family; but after a year, Congress was moved to Philadelphia, where they lived for nearly ten years. As wife of the first Vice President for eight years, Abigail became good friends with Martha Washington, and was a valued help in official entertaining. But after 1791, poor health forced Abigail to spend as much time as possible in Braintree. When John was elected president in 1797, Abigail was caring for his dying mother, and was unable to attend his inaugural ceremony. She became the second First Lady at the age of 52, arriving in Philadelphia in early May. Their house was shortly put in order, and she quickly held a reception as First Lady. John Adams discussed nearly every important problem with her, and most often followed her advice. When Congress broke for the summer, the couple left for home. By the time they arrived, Abigail Adams was exhausted and ill. When John returned to Philadelphia in November, he had to leave her behind. It was not until after the next summer recess that Abigail was able to return with her husband to Philadelphia. John Adams’ presidency was fraught with difficulties. American political parties were just taking shape, but Adams was not a party man. He maintained the same cabinet officers appointed by his predecessor, and they continued to look to Washington and Federalist party leader Alexander Hamilton for direction instead of to Adams, compounding his problems. When the nation’s capital was moved to Washington, DC, Abigail and John moved into the White House on November 1, 1800. 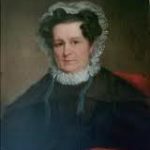 The city was still a wilderness, and the house far from completion, with many rooms not yet plastered and painted, but Abigail was committed to her role as first lady, and dutifully hosted dinners and receptions there. During that time, she hung her family’s laundry in the unfinished East Room. Abigail’s health, never robust, suffered in Washington. Of the four years her husband served as President, she was actually present for a total of only eighteen months, and much of her political role was conducted in correspondence. She nonetheless made a strong impression on the press and public. As First Lady, she was an adamant advocate for equal education for women. She was so politically active that her political opponents began to refer to her as Mrs. President. She was attacked in the press, her influence over presidential appointments was questioned, and there were suggestions that she was too old to understand the questions of the day. Abigail also took an active interest in her husband’s presidential campaign of 1800, when his primary challenger was their close friend Thomas Jefferson. Presidential families were responsible for covering the costs of their entertainment, and the Adamses were already enduring financial difficulties at the time of his presidency. Abigail went to New York to visit her son Charles and daughter Nabby in the autumn of 1800. Charles was an alcoholic and did not have long to live, and it was with great sadness that Abigail bade him farewell. John Adams received the news of his defeat in the presidential election at the same time he learned of the death of their son Charles. Thomas Jefferson succeeded John Adams as president in 1801. The Adamses returned to Braintree. For the first time in thirty-six years of marriage, they lived peacefully together without the pressures and demands of political life. Abigail was concerned about finances, and continued to keep herself busy with the day-to-day details of running her home. Throughout the following years, the family were plagued with illness. Their daughter Nabby was diagnosed with breast cancer. She brought her two daughters to the farm while she underwent surgery. Nabby’s cancer returned in the summer of 1814. She made the agonizing journey to the farm, and died three weeks after arriving. Abigail nursed her daughter until the end. Relieved at the return of her son John Quincy Adams from his diplomatic missions in Europe in 1817, Abigail had an initially strained relationship with his English-born wife, Louisa Catherine Johnson. She did not live to see her son become President, which occurred six years after her death. 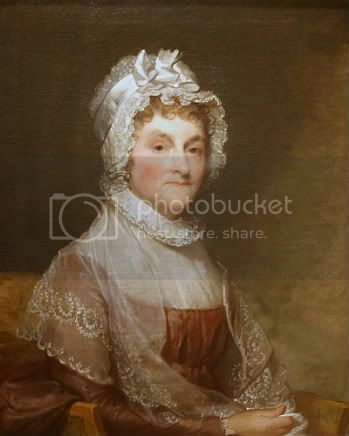 Abigail Smith Adams died on October 28, 1818, at the age of 73, leaving her country a most remarkable record as Patriot and First Lady, wife of one President and mother of another. Her last words were, “Do not grieve, my friend, my dearest friend. I am ready to go. And John, it will not be long.” John was greatly moved by her death. There is not a virtue that can abide in the female heart but it was the ornament of hers. She had been fifty-four years the delight of my father’s heart, the sweetener of all his toils, the comforter of all his sorrows, the sharer and heightener of all his joys. It was but the last time when I saw my father that he told me… [that] through all the good report and evil report of the world, in all his struggles and in all his sorrows, the affectionate participation and cheering encouragement of his wife had been his never-failing support, without which he was sure he should never have lived through them. John Adams lived eight more years, passing away on July 4, 1826, the 50th anniversary of the Declaration of Independence. He was buried beside his wife. 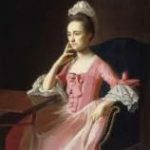 Abigail Adams’ years were not filled with great events, but her strong support of her husband made it possible for him to devote his time to the establishment of the United States. As a delegate to the Continental Congress, signer of the Declaration of Independence, diplomat, politician, first U.S. Vice-President and second U.S. President – John Adams was one of our most important Founding Fathers. 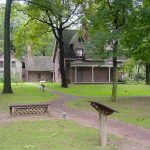 However, if Abigail Adams had not assumed the responsibilities of caring for their family and managing their farm, he would not have been free to fill those roles.